Perfect Halloween Craft that's an easy DIY and will last forever! 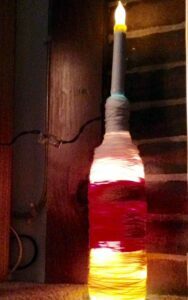 Recycling a wine bottle into a Candy Corn Light is a perfect Halloween Craft that can be made in less than an hour. Project uses easy to find supplies.